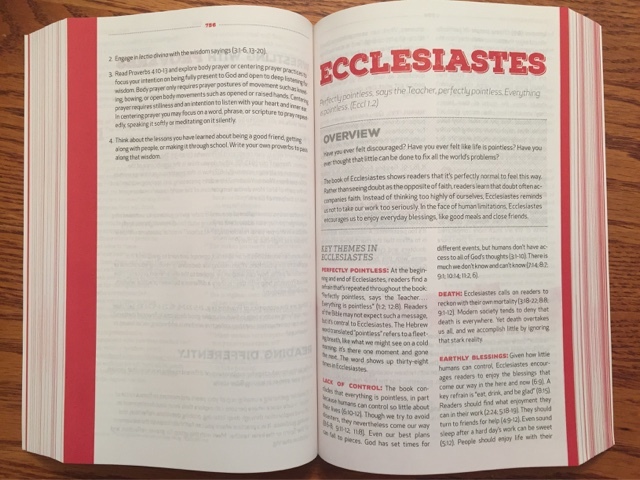 The CEB Student Bible was designed to help students engage with God's word. It should help teens ages 13 and up make a connection between the their world and the Bible. This Bible is written in the Common English Bible translation. This version was completed in 2011 and is sponsered by the Common English Bible Committee. One hundred twenty Bible scholars worked to translate this version. It uses naturally sounding phrases that resemble how young people talk, read, and write with their friends. An introduction to each Bible book, inlcuding an overview, key themes, and quick facts. 16 pages of maps by National Geographic with a map index. Multiple prayers and reflections written by students for students. Discussion questions, activities, and excercises for each book of the Bible. The indexes include key articles for each book, well-known and less well-known bible passages and stories. Everyone in our family has their own bible in the NASB version, but we love using other versions during our family devotions. This sometimes helps us understand things a little more or helps us see things in a different way than we had previously had. This new Bible version flows really well and is great for reading out loud. 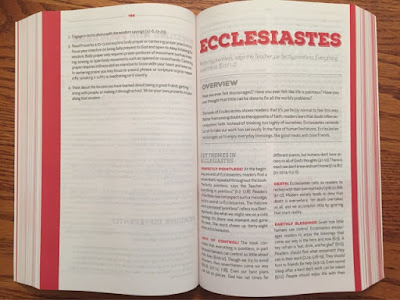 The added reflections included in the Student Bible are well written and can help the teens relate to the topics. We already own the Deep Blue Kids Bible from Abingdon Press that is written in the CEB version, and my older kids are enjoying this Student Bible as much as we do the Kids Bible. I have one copy of the new CEB Student Bible to giveaway to someone living in the United States or Canada. Please enter the Rafflecopter below. 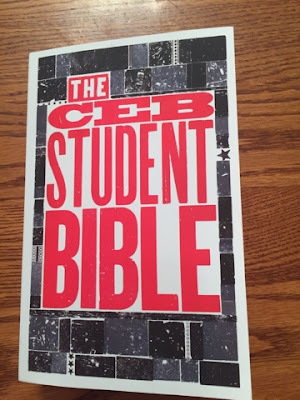 Disclaimer: I received a copy of the new CEB Student Bible from Abingdon Press free of charge in exchange for my honest review. All opinions are my own and no other compensation was received. My favorite Bible for years was a different version of "The Student Bible" I received as a teenager. If I win, I might keep it for myself, at least to read through once then share. I have a 15 year old son who NEEDS this! I have a few that we use, but I could see this being his connection to The Word. My son and I would study this bible together! My 13 year old son would benefit from this. This would be perfect and ideal for my 12 year niece. She is in 6th grade and this seems like it would help her!! My son would use this one. My oldest child would use this. My children would probably have to share it (for now) as part of our Bible study curriculum. I think I would use the bible, I have been looking for a Bible that easy to understand and a joy to read. I would use this for my daughter. Thanks for the giveaway. Good luck everyone! My 12 year old daughter would like this to use at youth group. I would like this for my 14 yoa step-daughter. Thanks. We're hoping to adopt an older child, and would love to have this to give him or her! I would give to my nephew...he is a teen and very new Christian and needs some guidance. This would be a perfect gift for my oldest daughter! Thank you for the chance! This would be a great study material for my siblings and I.
I like using various translations too, especially to help with difficult passages while studying in Bible Study Fellowship. I think I would read it myself and then give it to my son in a couple years when he turns 13. The Bible would be for my daughters. I would try this translation for myself please. kristiedonelson(at)gmail(dot)com Thank you. My daughter would use this.